President Trump predicted that Democrats and Republicans would come together for a short-term fix for the Affordable Care Act (ACA), days after he suspended the cost-sharing payments to insurers that lowered the cost of insurance for lower-income Americans, and he claimed he'd provide the largest tax cut in U.S. history. At a Cabinet meeting Monday, the president called for "at least a short-term fix on health care," of both Democrats and Republicans, but he also predicted a "100 percent Republican -- no Democrats" long-term fix of the ACA. That permanent solution, he believes, will be in March or April of 2018. 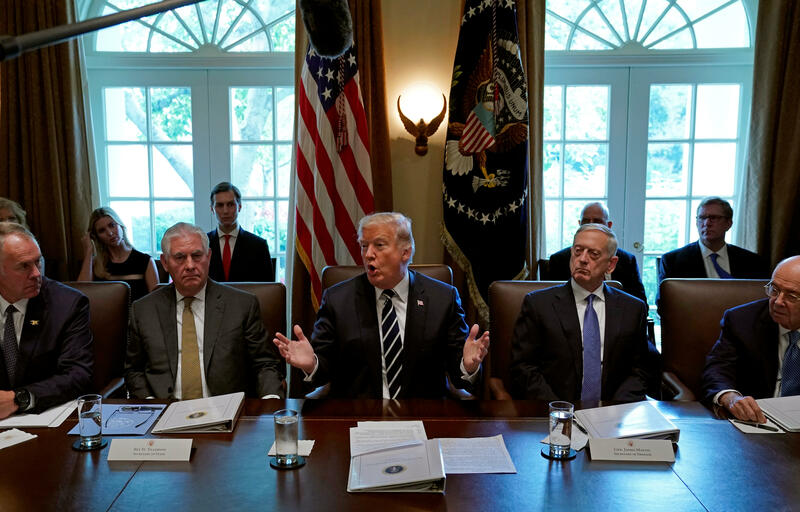 "There is no such thing as Obamacare anymore," Mr. Trump said, flanked by Secretary of Defense James Mattis and Secretary of State Rex Tillerson. He also addressed Congress' inability to pass health care reform legislation thus far after multiple attempts at repealing and replacing the Affordable Care Act. Mr. Trump was also asked about former White House strategist Steve Bannon's war on establishment Republicans, which he excused with a suggestion that Bannon was just "very committed to getting things passed." The president shares Bannon's sentiments up to a point and complained again about the Senate's failure to pass a repeal of the health care law. "[W]e are not getting the job done, and I'm not going to blame myself. I'll be honest," he said earlier. Some Republicans "should be ashamed of themselves," he said, a reference to Republicans who opposed the health care bill. Mr. Trump commented on his administration's decision to end cost-sharing reduction payments (CSRs) put in place under the Affordable Care Act. The shift will end subsidized payments to health insurance companies, which have helped make health care more affordable by lowering individual premiums. "I want the money to go to the people," he said, adding that he was optimistic for the future of health care now that he had "knocked out the CSRs" and "cut off the gravy train" to insurers. According to the Congressional Budget Office, CSR payments amounted to an estimated $7 billion in 2017. He noted his hope to also lower the cost of prescription drugs. "The drug companies, are are getting away with murder. And we want to bring our prices down to what other countries are paying," he said. During the Cabinet meeting, Mr. Trump also proclaimed that his tax plan would provide "the largest tax cut in the history of our country." He also claimed that the plan is getting a positive reception. "I think we're getting tremendous receptivity from the people I hope we get the same receptivity from Congress," he added. Mr. Trump called for "phase two" of the Iran nuclear agreement, following up on his Friday announcement that his administration "cannot and will not" certify Iran's compliance with the Iran nuclear agreement to Congress. This, he said could be "positive," or could result in "total termination," which he said "some people might say is more likely." "A lot of people agreed with what I did," Mr. Trump said of his decision. The president again stressed the need for a wall along the southern border and criticized Mexico for bringing drugs and crime into the United States from people "literally pouring through" the border, though he did not cite any data to support this contention. Last week, Mr. Trump outlined his administration's immigration reform priorities in a letter to Congress. Among several points was his call to created a merit point-based immigration system and to further limit family-based green cards. "Mexico is having a tough time right now in terms of crime. More than ever, we need the wall," he said.